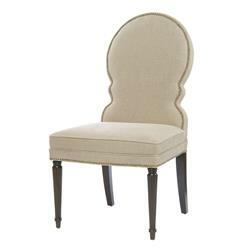 Natural flax colored Belgian linen upholstery. Custom options available. 4 yards required for us to reupholster this in a fabric of your choice. Ships within 14 business days. Custom upholstery items have a 8 week production lead time. Please allow up to 2 additional week transit time for your item to arrive. Classic Venetian style gets a modern twist with the shapely silhouette and graceful proportions of this Sadie dining chair. Fluted legs and scrolled arms showcase the hand carved craftsmanship while nail head trim around the back and seat base define its distinct shape. The heirloom quality chair is built to endure generations using classic techniques and modern mechanics.